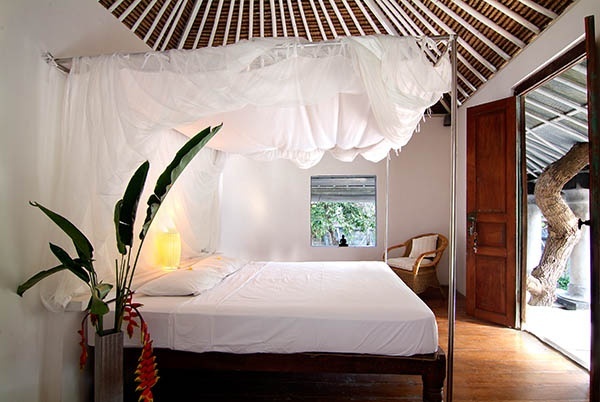 A private paradise close by a river and ten metres from the beach, Rumah Matisse stands in a quiet village surrounded by rice-terraces 25 mins from Seminyak. Rumah Matisse accommodates up to ten, with two master suites on the first floor, two independent bungalows and a fifth bedroom on the ground floor; all rooms have ensuite bathrooms. A verandah overlooking the 23 x 6 metre pool, river and sea runs the length of the 2-storey main building and provides alfresco dining. An entertainment room with 24-hr internet, satellite TV and DVD/VRC players, inside patio and kitchen complete the ground floor. Covered outdoor chillout; 6 staff. Rumah Matisse is unashamedly romantic. Its funky neo-colonial and traditional fusion style also incorporates the natural world - literally: a towering fig tree grows through the verandah and the upstairs balcony and roof of the main building. A reed-thatched roof, bold black, white and silver décor, polished cement floors and a raised colonial-style verandah with large grey marbled columns are just some of the features. All the downstairs rooms of the main house open onto the verandah which is furnished with mats, cushions and a dining table seating 10. A large chillout area, complete with low tables and a sound system, is sheltered by a thatched roof and large enough for 15 people. The infinity pool has a wooden platform, complete with daybeds and a serene statue of Buddha, a peaceful spot for relaxing. Small groups of max 10 persons, romantic getaways. The garden is suitable for weddings and parties with up to 50 guests. STAFF: Services of manager, chef, housekeeper, engineer, gardener and security officer included. HOUSEHOLD COSTS: Electricity, water, cleaning, gardening supplies and local taxes included. Rates include welcome drinks on arrival and 24 hours’ free Internet connection for all guests. In addition, guests renting the entire house will receive complimentary breakfast, lunch or dinner, complimentary welcome massage and transfer to airport. NOT INCLUDED: Baggage handling, telephone, fax, telegram, and Internet connection charges; laundry service, food, soft drinks/liquor; personal items and expenses; any excessive cleaning required upon departure; car rental. An administration fee of USD 50 will be charged for any change of booking after a reservation has been confirmed. In case the final payment is not received by 30 days before arrival, the reservation will automatically be cancelled and a cancellation fee charged equal to the deposit. Services offered on request: VIP airport service to avoid long delays at immigration; car and motorbike rental. Special events and dinners catered for; the chef offers international and Indonesian cuisine. Personal trainer; in-house spa services: massage, facial, pedicure, manicure, etc. Nanny service; max 2 cots for babies can be provided on request. Laundry service. Direct access to the beach; lively beachside restaurants of Echo Beach, 5 mins walk away. Cultural capital of Ubud, 40 mins drive. Tanah Lot, one of Bali´s principal temples, 5 mins. Nirwana Bali Golf Course, Asia´s number 1 golf course, is 5 mins away beside the temple of Tanah Lot. Umalas Equestrian Centre, 10 mins. Cosmopolitan Seminyak: 25 mins: wide choice of international restaurants, lively bars, edgy nightclubs, craft shops and boutiques. Ngurah Rai International Airport, Denpasar, 31.7 km/45 mins. Airport departure tax: On leaving Bali, payment of an airport departure tax is required after check-in, Rp 150,000 for international departures and Rp 50,000 for national departures. Private chauffeur-driven transport from/to airport available on request. NB: Driving in Bali is on the left. The property is entered via a large silver gate: there is a large parking area with a Balinese temple surrounded by bougainvillea.